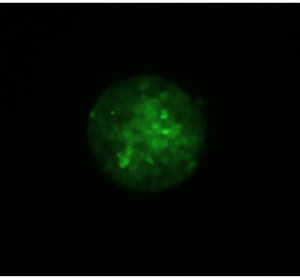 By isolating cells in microwells or arrays of patterned cell colonies, and transfecting a single cell per colony, monoclonal cell lines can be produced without lengthy limiting dilution steps. Incubation and repeated antibiotic selection can be performed without suspension and replating. Monoclonal cell colonies with the desired phenotype can be picked and transferred to a standard culture dish. Plate cells in microwells or arrays of patterned matrix protein to isolate cell colonies. 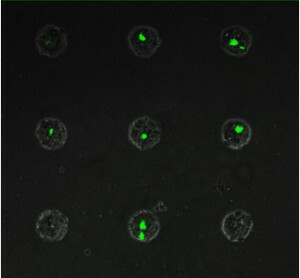 Take advantage of cell selectivity and dosage control to transfect a single cell per colony. 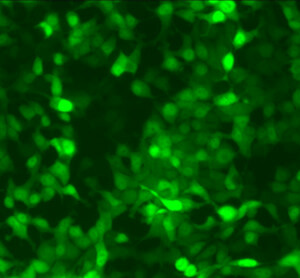 Incubate, proliferate, and chemically select for stably transfected cells directly on the experimental substrate. Aspirate and pick cell colony, transfer and expand cell line in culture dish.